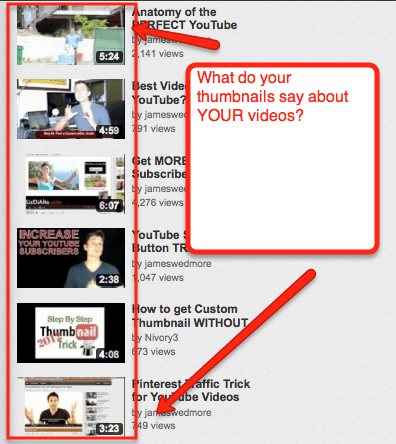 Are you frustrated by the default random YouTube thumbnail option for your videos? Do you wish you could create something custom to improve your views? Since December 2011, YouTube has been making some radical changes to their site. Everything from the home page layout, website colors and even the look and feel of the video players have changed dramatically. But none of these aesthetic changes have had any real impact on the way we need to be marketing videos on YouTube. However, this latest change may just be the biggest game-changer that savvy video marketers can take advantage of! Introducing the Custom YouTube Video Thumbnail. From YouTube’s Support Portal, instructions for uploading a custom thumbnail. In April 2012, YouTube quietly rolled out the option for all YouTube channels to become “YouTube Partners.” This original YouTube Partner Program consists of a selective club of content producers with a large audience and a ton of views. These original partners have access to additional features and options to help market their videos that no one else had (for example, the Custom YouTube Video Thumbnail). Then YouTube announced that anyone could become a partner, and everyone rushed to monetize their channel and fill their videos with a bunch of distracting ads and 15-second commercials that slightly annoy viewers. Yet there were still no special partner privileges like the Custom Thumbnail option… until now. YouTube has been quietly (and selectively) rolling out the Custom YouTube Thumbnail function to some channels for the past month or so. What Is the YouTube Custom Thumbnail? No change or update has had me quite as excited as this one! Until now, YouTube randomly selected (and when I say random, I really do mean completely random!) three still images for you to choose from to use as your video’s thumbnail. This means you are probably forced to choose one of the worst screenshots possible. You can now choose your custom thumbnail. But this is changing. Select users can now upload an image of their choosing to represent their video. These users can now choose a thumbnail for their video and this thumbnail will be displayed in search result pages, related videos and as the start image on embedded videos. This is a powerful new functionality for YouTube marketers. One of the easiest ways to get more views on your videos is to have an appealing thumbnail image. When you have little control of your thumbnail selection, you leave a lot up to chance. Choose thumbnail images that best fit your YouTube marketing goals. But there’s more. YouTube actually measures the click-through rate (CTR) of your video. In short, if your video is ranked #3 for your prospective keyword, yet everyone is choosing to click on YOUR thumbnail over #1 and #2′s thumbnail, chances are YouTube will bump you up in the rankings! Do You Have the Custom Thumbnail Option? How can you get the custom thumbnail option? I don’t have an answer for you. I’ve seen new channels, old channels, channels with a lot of views and channels with only a few videos that have this new option, while others do not. I haven’t found a pattern, and can only assume that YouTube is slowly rolling this feature out to all (fingers crossed). To check if you’re one of the lucky YouTubers, head on over to your Video Manager and select the Edit button on any one of your past videos. 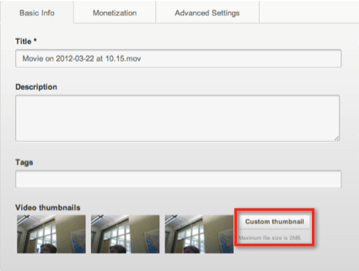 Below the three options for thumbnails, you will discover the Custom Thumbnail button. What if You Don’t Have the Custom Thumbnail? If you don’t have the custom thumbnail option just yet, my recommendation is to be patient. In the meantime, I believe monetizing your channel helps your chances—even though I’ve found non-monetized channels with this function available. 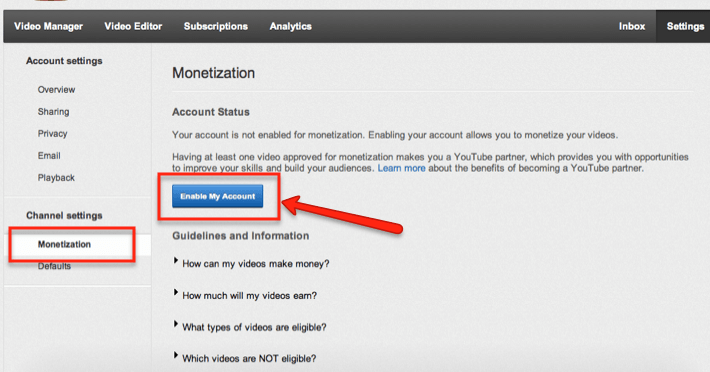 You can enable monetization on your YouTube channel. In your YouTube Channel Settings, select Monetization and activate it. Here is my strong recommendation: Even though you want your channel monetized, you can select which of your videos will have advertisements. You’ll want todeselect as many as possible. I decided to simply have three or four of my oldest videos monetized. Unless you are bringing in millions of views, you will not see a lot of money from this. It’s better to focus your video efforts on bringing in new leads and customers through your funnel. What if You DO Have the Custom Thumbnail? If you discovered that you are one of the lucky few who have already been given this powerful marketing gift, pay close attention: You need to create custom thumbnails for all of your past videos as soon as possible. It’s my theory that this custom thumbnail option is too powerful and it will be abused. When that happens, YouTube may just take it away for good. Find a graphic designer to go in and add a custom thumbnail to all of your past videos. What Should Your Custom Thumbnails Look Like? Check out this short YouTube video on how to create the “perfect” YouTube thumbnail. Just because cute babies and pictures of pretty women get more clicks doesn’t mean you should use them. 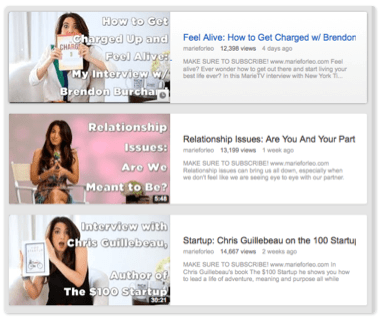 If your thumbnails are not relevant to your content, your new-found audience may get angry. Not only will they “thumbs down” your video, they will leave immediately. YouTube tracks Time on Page. And with an average time on page of just 3 seconds, your rankings and views will plummet. Make the effort to choose thumbnail images relevant to your video. Instead of using a random image, find a still shot from your video. Take your time and look for the perfect shot that really describes what your video is all about. This could be an action shot, or a close up of your face, or something that grabs people’s attention. Choose thumbnail images that capture your viewers’ attention. Using photo editing software, add some benefit-driven text to this still shot. People should be able to quickly read the text and know exactly what your video is all about. This thumbnail image highlights the contents of the video. Bright neon colors tend to stand out far more. Incorporate bright, contrasting colors into your thumbnail so the viewer’s eye travels right over to you! Even though I’m really excited about this new feature, it doesn’t take away from the ultimate strategy for YouTube success: Provide remarkable value! As always, continue to deliver exceptional content to your audience and empower the viewer, and the results will come. Go check your YouTube channel to see if you have the Custom Thumbnail option. If you don’t, go ahead and activate the monetization feature on your account, and just be patient. If you do have the custom thumbnail feature, you have some work to do! Get those thumbnails made as soon as possible!